I’d never made a potato salad before this one. Well… actually I had made warm salads that include potatoes… but never the dish we traditionally call by that name – new potatoes bound together in a mayonnaise-based dressing. Several years ago, the American Head of IT where I worked shared his potato salad tips with me, after he hosted the IT summer barbeque party in his back garden and I raved about his magnificent potato salad. He’d been a professional chef in his previous career; yes I was surprised at the job change too – for the record, he was very good at both. I wrote his recipe down at the time but mislaid it and by the time I realised, he’d retired and moved back to the States. But a few tips stuck in my mind. 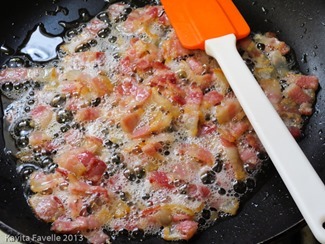 Use lots of fatty bacon and make sure you include all the bacon fat that renders as you cook it. Don’t stint on the mayonnaise. Add chopped capers or gherkins for acidity and crunch. Toss the potatoes in the dressing while they’re still warm. So one of the dishes I was determined to try with our home grown new potatoes this year was a classic bacon-laced, mayonnaise-heavy potato salad. Of the two early potatoes we’ve grown, Home Guard seems better suited to this dish than Red Duke of York, as it holds it shape better when cooked, so that’s what I’ve used here. And, of course, the potato salad had to live up to my memories of that magnificent lost recipe. In the end, I made up the recipe on the spot, and by very good fortune, it came out perfectly. The photos really don’t do this justice at all, which is totally my fault as I decided to make my first ever potato salad less than an hour before we headed out to the annual summer barbecue at our allotments and I only grabbed a couple of snap shots of the finished dish, in the box I mixed (and transported) it in. I should have spooned a neat pile into a small clean bowl to show it off better but instead you’ll just have to take my word for it that this recipe is worth trying. I’m calling it Heart Attack Potato Salad because of the ratio of dressing to potatoes and the amount of fat in the dressing! Note: Kewpie mayonnaise is made with egg yolks rather than whole eggs, which makes it much richer than typical European commercial mayonnaise brands. The apple and malt vinegars give it a slight sweetness and the MSG creates an umami richness. If you can’t get it, either make a rich home-made mayonnaise or substitute with regular and add a small pinch of sugar. Note: I like the sweet style pickled gherkins rather than the very sour type or the dill pickle ones, so that’s what I used here. Note: Bacon doesn’t need any additional oil to fry, but adding a touch of extra oil at the beginning lets it take on lots of bacon flavour, to add to the dressing if your bacon doesn’t render much out. For a very slightly healthier version, omit the vegetable oil. 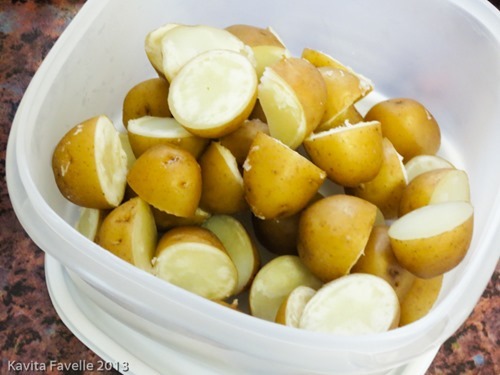 Chop your new potatoes in half or quarters, depending on size, and put them on to boil. My preference is for bite size pieces in a potato salad, though some people prefer much smaller dice. Add a tablespoon of oil to a frying pan (if using) and gently fry the chopped bacon. 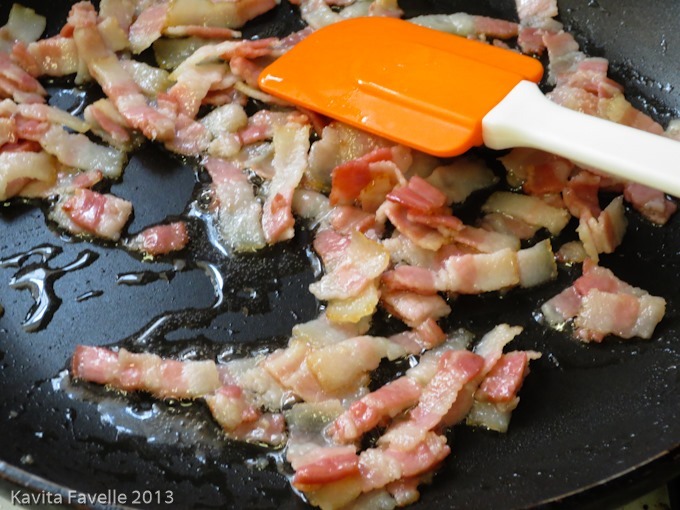 I don’t like bacon fried until it’s crunchy, so I fried mine until it showed a little browning but was still soft. 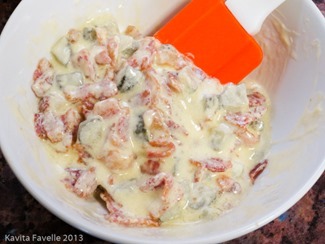 Allow the bacon to cool a little, then combine bacon, bacon fat / cooking oil and mayonnaise and mix well. You’re adding a lot of extra fat to the mayonnaise emulsion so it may take a bit of effort to mix it into a smooth dressing. 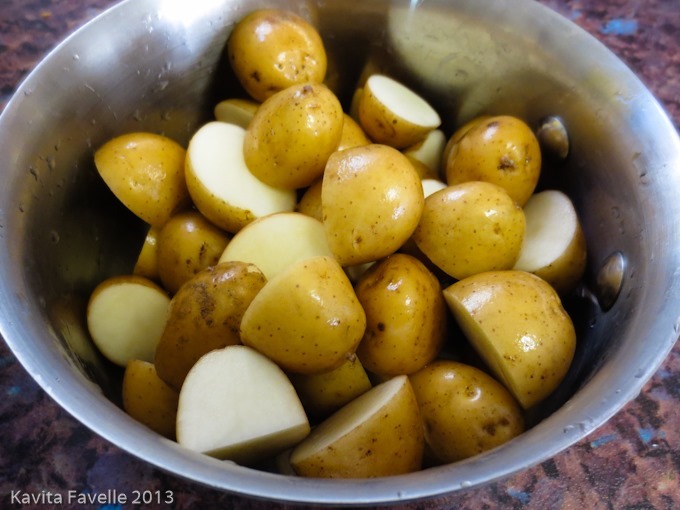 Once the potatoes are cooked through, drain and leave in the pan to steam and dry a little further. While the potatoes are still warm, mix thoroughly with the dressing. If you like, you can do this by putting potatoes and dressing into a sealed container and gently shaking and turning. As a potato salad novice, I’d really like to hear about your favourite potato salad recipes or tips. I was utterly delighted with the tastiness of my first attempt, which I’ve shared here, but now I’ve dipped my toe in, I’m keen to discover more excellent home-made potato salad recipes. All advice welcome! 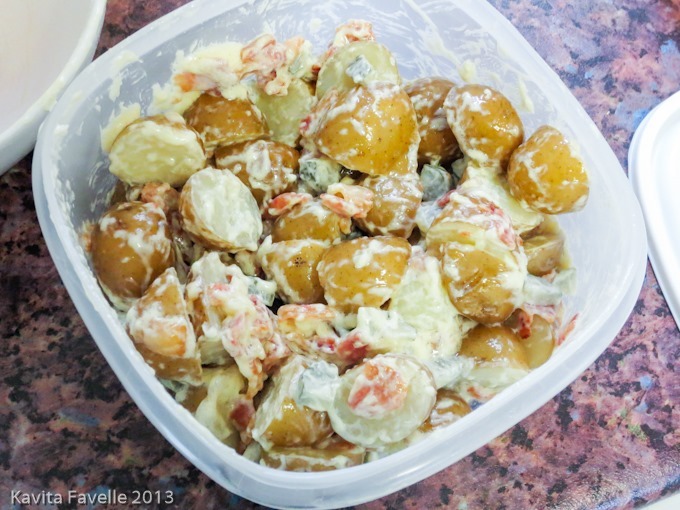 20 Comments to "Heart Attack Potato Salad"
Our favourite this summer has been new potatoes dressed with a little oil and vinegar while hot, then with only garlic mayonnaise added, just before serving. I’m sure the addition of some chives or spring onions would enhance the flavour, but it was a useful salad for unexpectedly hot days. Love garlic mayonnaise too. Your recipe sounds gorgeous. Well done you! There are a million variations on potato salads, and they are rather a regular item over here during the warm weather months. This one looks delicious! 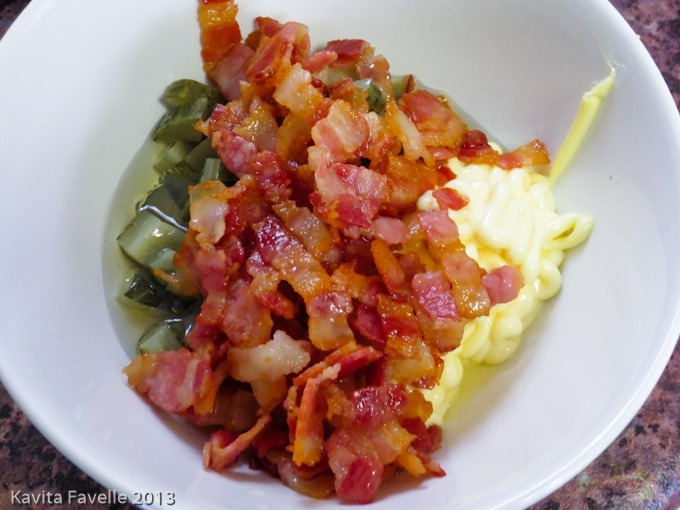 (Potatoes may be my favorite food, and one can never go wrong w/bacon in my book.) 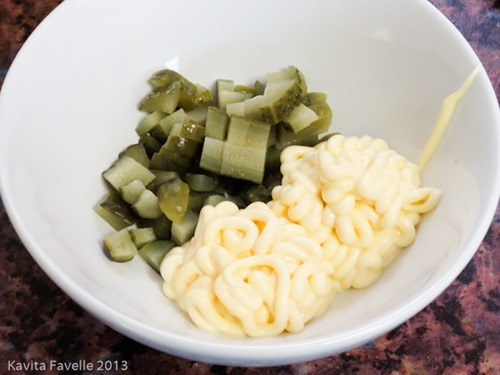 Variations over here include diced celery (for crunch), finely diced onion or green onion, and using mustard in addition to mayo. (Mustard gives one further capacity for creativity, because there are many mustards from which to choose, although a classic American recipe would have the cook use the French’s brand bright yellow mustard.) Some cooks over here add all variety of crisp, diced veggies (carrot, for example) as well as seasonings. (Zingerman’s usually has no fewer than 3 potato salads daily in the deli, and one of them has a pronounced garlicky note.) Another item of note this side of the pond is the inclusion or exclusion of diced hard-boiled eggs, and I’m rabidly opposed to that. I do like mustard in potato salads too, so I’d try that and actually have French’s in my cupboard along with some English and French mustards. But not the diced celery, can’t stand the stuff! I have enjoyed potato salads with hard boiled eggs, Russian style, those are good too. Love this recipe. My recipe is similar to Suelle, spring onions, whole grain mustard, garlic mayo and lots of gherkins. Next time i’ll throw in some bacon to the mix too. This looks completely gorgeous, I used to hate potato salad. I think it’s one of those dishes that you kind of grow up into. I have not so fond memories and lipsticked aunties quaffing cheap wine, cackling to each other at family parties, looking around for me to kiss on the cheek and say how cute I was. That I don’t dispute, I am very cute of course, but the the sight of soggy drumstick coupled with a solitary cherry tomato and fat dollop of nasty overly salty supermarket potato salad just filled me with despair, and I often either dived into the sausages or went straight to the cheesecake. I think made right the potato salad is a joy to behold, I make mine with crunchy green beans and pokey english mustard thrown in. Cute story, thank you Adam! Haa, I can just see those aunties aiming in your direction. Your crunchy green beans sound good, though I do adore gherkins! Meant to chime in on this earlier – we are talking potatoes after all! I tend to avoid doing the heavily mayonnaise-y thing for potato salad – so I might do a mustard dressing and add capers, spring onions, dill, parsley, a bit of lemon zest and maybe some toasted sunflower seeds for crunch (having said that, I do like a classic Russian-style salad with mayonnaise, eggs, peas and pickled gherkins). Another one that I’ve done a few times is a Georgian potato salad that combines ground walnuts, fried onions and a yoghurt-y dressing, definitely one of the more unusual ones. I love the mayo ones but your various ones sound great too. Fried onions sound good, though not the walnuts for us I think. And yes potato and egg versions always good too. I do love bacon in potato salad! Oh yes!! This is my kind of potato salad. 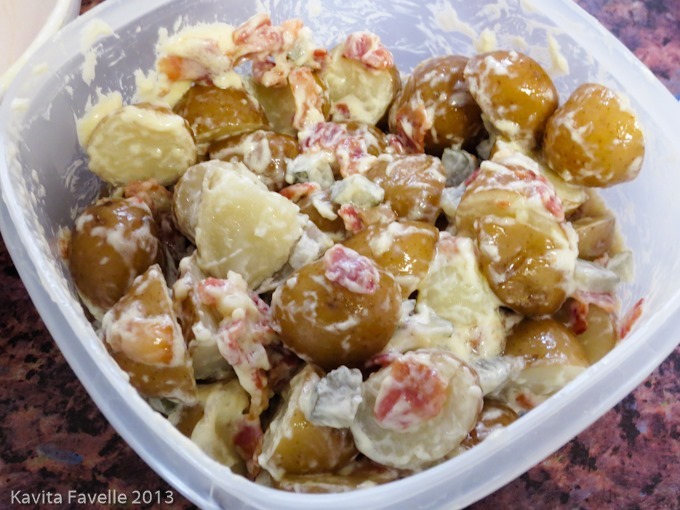 Next time I make potato salad, this will be it. I may add a little chopped dill though… it’s a habit thing. Wow now that’s a potato salad!